Time away from the stresses and strains of business and everyday life can work wonders for both our physical and emotional health, giving us time to relax, unwind and take perspective on life and I have found you the perfect location to do just that. Whether you are after one night, a weekend or longer, want to escape by yourself, with a partner or a large group, there is something for everyone at the beautiful Mains of Taymouth Country Estate and Golf course. 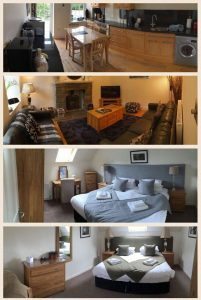 Hidden away in the Scottish Highlands in a little village called Kenmore is an award winning holiday complex with a 9 hole golf course, stables and trekking center, delicatessen with a large selection of local produce, restaurant and bar. They offer a variety of accommodation styles to meet everybody’s needs and budgets with luxurious features including hot tubs, log fires and pool tables depending where you stay all surrounded by mountain top scenery. My husband and I have just returned from the most amazing weekend in the Archway cottage, a two bed property with a hot tub and log burner, absolute bliss. The cottage was like a home from home, it was beautifully decorated with everything you could possibly need and had the comfiest bed. The hot tub is set to 38 degrees for the duration of your stay and regardless of the Scottish weather it makes for the best seat to take in the views of the Highlands and to let your stresses dissolve in the bubbles. Once out of the hot tub what better way to warm up than in front of the log burning fire with a glass of prosecco and relax for the evening. On our second day my husband and I joined in with a guided pony trek which took us around the estate and along the shore of Loch Tay. It was an incredible experience taking in the most picturesque views in one of the most magical way possible and something I will never forget. The staff at the stables were both friendly and experienced and managed to make me feel at ease despite the sudden fear of horses that developed the minute I was in the saddle. Whether you are a beginner or an experienced rider the trek is not to be missed. Having worked up an appetite we dined in the onsite restaurant and tasted haggis for the first time. I wasn’t sure what to expect but it was surprisingly delicious. 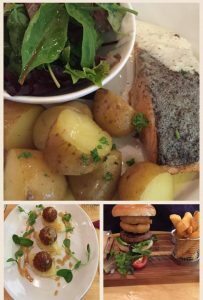 For main I had the salmon and my husband a burger, the food was outstanding and worthy of any 5 star restaurant. 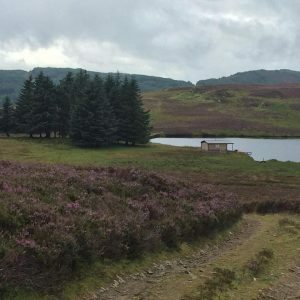 Part of the beauty of Taymouth is that it is hidden away from the hustle and bustle of reality and you can happily switch off and unwind without needing to leave the complex but if your idea of a break away is a little less sedate and a bit more active then don’t worry as you are only a short drive away from some amazing experiences. On our second day we drove 5 minutes up the road to the Highland safari center where they offer a range of experiences from off road driving to deer feeding. We were treated to a 2 ½ hour off road safari where we ventured up into the highlands with viewing stops along the way. I thought the views from the hot tub were impressive and indeed they are but the views from up above are just incredibly breath taking, especially when we were treated to a viewing of stags grazing on the other side of the loch. On the third day we ventured to a nearby village and relaxed in true Scottish style with a tour of Dewar’s whisky distillery, topped off with a “wee dram” straight from the cask of a 1989 whiskey. Another unmissable experience. If the idea of being hidden away in the Scottish Highlands sounds too secluded, then it’s important to point out that The Mains of Taymouth is less than two hours from both Glasgow and Edinburgh so you could easily enjoy a city break teamed with sleeping in the country side. Our weekend away was phenomenal, Mains of Taymouth is a little piece of paradise that has stolen my heart and I cannot wait to return.